What are ESL Cloze Exercises? Be Used for ESL/EFL Students? ESL cloze exercises can be used with all levels of ESL or EFL students. Simply put, a cloze exercise is a "fill-in-the-blanks" worksheet or handout. They can be used for lessons on verb tenses, articles, prepositions, pronouns, etc. Basically, they can be used for all grammar lessons, teaching any part of speech, or for vocabulary reinforcement. They are routinely used by ESL and EFL teachers for quizzes, tests, and homework. The worksheet can consist of single sentences, whole paragraphs or larger passages. The directions will usually say something like, "Fill in the blanks with the correct words." Or if you are specifically testing a particular part of speech, the directions might say something like, "Fill in the blanks with the correct preposition." Teachers need to be sure that the directions are clearly written. It's best if there is only one possible correct answer per blank. 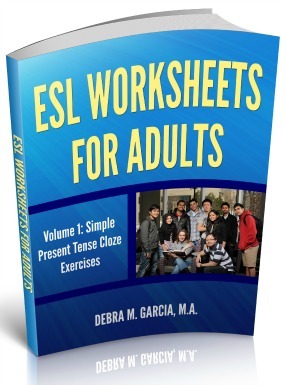 ESL teachers often use cloze worksheets for quizzes and tests. The biggest advantage to teachers is that it saves a lot of time correcting papers. Since most ESL and EFL teachers aren't paid sufficiently (if at all) for prep time, anything that saves time outside of the classroom is a great tool! Be careful not to rely only on cloze worksheets to teach English to speakers of other languages. Students are often able to choose the correct word in a fill-in-the-blanks exercise, but the real test of a student's progress should be whether he or she can produce the target language in speaking or writing. Here are few examples of cloze sentences for the Present Perfect tense. She __________ never __________ to Germany. They __________ always __________ each other. I __________ __________ to Mexico many times. __________ you ever __________ squid? __________ she __________ the movie yet? You can see from these examples of cloze sentences that the student has more than one choice for the main verb. He or she just has to make sure that the correct form of the verb (the past participle) is used. The helping, or auxiliary, verb can only be "has" or "have," depending on the subject. Note that ESL cloze exercises with this much flexibility in the answer should only be used for intermediate to advanced ESL students. In some cases, it's appropriate to provide the possible answers for the student to choose from. A list of possible answers should be accompanied by directions that tell the student to "use each answer only once." Teacher Time-Savers and a Warning! Creating ESL cloze exercises is time-consuming, but once you have a good exercise you can use it over and over. I've found that some of the fill-in-the-blanks worksheets that I've downloaded from the internet have had mistakes, so try to be sure to proofread the free ESL worksheets you find on the internet. Including any you find on this website! I've written and compiled 27 Present Tense Cloze ("fill-in-the-blank") exercises and but them into a book. They are yours for free. And you will receive my best teaching tips every month or two when you sign up to receive the ebook. Just fill in the info on the right side of this page and you'll have instant access to download the exercises. Here are a couple more worksheets I've developed for use with my students. You are free to download them and use them with your students. Please let me know if you find any errors! Hopefully, I'll be adding more in the near future! 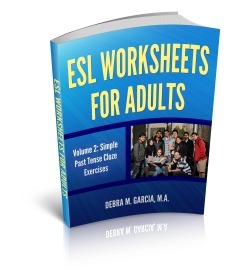 Volume 2 of my worksheets ebook is now ready. It's not free, but it's a good deal! 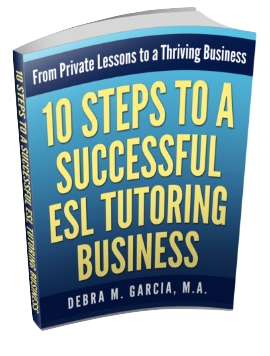 It has all the Simple Past tense fill-in-the-blank exercises you could possibly need.